If you are a great College Football handicapper, you may want to try your hand at another game—college basketball. Of course, there are major differences involved in handicapping college hoop. One of which is there are three times as many Division I basketball teams as there are NCAA Division I Football teams. College basketball is a whole new game, but it is worth pursuing, as there are hundreds of wagering opportunities each and every week of the season. College basketball handicapping doesn’t begin during the start of the regular season. It starts right after the NCAA Tournament is over and the National Championship has been decided. Players are graduating, new players are coming up, coaches are leaving team and new ones are coming into the fold. It’s a major time for transitions. This is a good time to simply tie things up from the season that just ended. During the summer, monitor the major sports sites such as Fox and ESPN to keep up on any happenings. 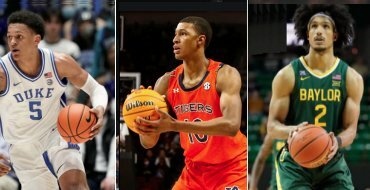 You should know which players are deciding to enter the NBA Draft early and which are graduating. During the off-season, you’ll also need to keep up on any players who have lingering injuries, any who face suspension for disciplinary or academic reasons and other such events. The college basketball scene starts to heat up in the very late summer and early fall. That’s when the preview magazines come out with team rosters, stats and projections. Use these as a foundation for your handicapping. They are the initial part of your research for the upcoming college basketball season but they are just one small part of the research you’ll need to perform to be a successful handicapper. Be sure to pay attention to any freshmen who could be major difference makers, to returning vets and players who look they may have a breakout season. You’ll also find helpful previews online at the major sports sites. Here are a few things to consider. A rookie team with a lot of talent and a veteran head coach will make mistakes at the start of the season but could be contenders partway through as they gel. A coaching change may result in a whole new system being adapted and that can really throw off a team as they adjust to the new style. Also, when a new coach comes in some promising recruits may elect to attend another school and top players may decide to transfer out to another program. Where did those top players go? Chances are they will have to sit out a year before they can play for their new school. But maybe the waiting is over and this is the year they get to take to the court. Look at that returning NCAA Championship team. Are they coming back loaded for another run or decimated and having to rebuild? One of the tough things about college basketball is that premium players will often leave for the pros after one or two seasons, which creates a lot of instability and surprises. In college basketball betting, one new major player can make a big difference. That huge, big bodied center, that major playmaker or that top notch outside shooter can get a college basketball team to a whole new level. This is the time to see which clubs are rising, which are falling and which ones are pretty much remaining stable. Look for teams that are ready to breakout, especially at the start of the season when nonconference play is in effect. They may play a bunch of weak clubs and could have a big against the spread run in them. Consider each team’s schedule, both nonconference and conference games. Some great teams end up with relatively light schedules and some have a list of daunting teams they have to face. Even within conferences, you’ll find disparity in schedules as in many leagues some teams may see some opponents once and others twice. Strength of schedule plays a major role in a team’s ability to win. Before the season starts is the time to search for and to predict the unpredictable. You want to be ahead of all of those people who report and comment for the sports magazines and newspapers and who talk it up on the airwaves. College basketball, like the NBA, has no wall between the fans and the court. Plus, many college teams have vociferous fans that can make a huge difference in home games. Consider team travel, home court and fan influence on officials when handicapping a game. Also, look for clubs that struggle on the road and those that excel when away from home. Likewise, you will find teams that are unbeatable when on their home court. The college basketball season starts in November and ends near the beginning of April. That includes March Madness, which begins in the middle of the third month of the year. For about five months, you’ll have a huge number of betting opportunities as each Division I college basketball team plays about 32 regular season games with the first 18 or so being nonconference contests. These nonconference games often offer huge mismatches that sports bettors can exploit when wagering on the spread and over/under. Because there are so many conferences and teams, it’s best to focus on two to four conferences and their opponents. The majors are the ACC, SEC, Big 12, Big Ten, Pac-10 and Big East. But you don’t have to limit yourself to these conferences. You may want to focus on two or three majors and then a mid-major or two such as the Missouri Valley, Western Athletic or Conference-USA. You can certainly pick and choose teams from other conferences too. The point on focusing on specific conferences is to help alleviate the clutter of having so many teams, matchups, and lines to consider. A weekend of handicapping and making college basketball picks on all the conferences can make your head spin. As the season starts, monitor various sites, including fan and sports websites and the NCAA Basketball site. Follow the teams, study the box scores and the stats and be sure to immerse yourself in the games. You won’t be able to watch as many games as you should but you can certainly watch highlights and the major sports shows. Scour the early college basketball lines that are posted the night before. These tend to be soft and offer some good bets to the sharp handicapper. Before betting do your matchups, check to see if there have been any injuries or suspensions and where the teams are as far as the fatigue factor, recent wins and loses and other areas are concerned. Some teams get tired, others give up during the season, some take time to gel and others rebound after a major loss. Carefully consider that undefeated team and when they are most vulnerable for that surprising loss. In big games with stifling defenses, look to each team’s free throw percentage. This will often determine the outcome as to which teams covers the spread. And always consider the coach. College basketball coaches have different styles and schemes. Some are amazing strategists, some are masters at that last second win and others get their clubs to play a highly disciplined game. Some are great off a heartbreaking loss, while you can just about pencil in others to fall flat on their face in the same situation. When you find something you like, go for it. There is a lot of money to be made betting NCAA basketball and that is what makes college basketball picks a great opportunity for every sports bettor who wants to put in the time. Be sure to do your homework when it comes to college basketball handicapping. It will pay off when you go to make your college basketball picks. Always look for the edge, the skinny and where the smart money is. The college basketball season is a primo time to make cash.